This is what we call a “Department Store Telescope” Among amateur astronomers, these are infamous for their long list of deficiencies. This ubiquitous telescope sells new for $80.00 to $150.00 in discount stores, department stores, camera shops, on the internet and even in “educational” toy stores. You will recognize its distinctive traits. First, a flashy paint job. It shines! It glints in the sun! It is guaranteed to dazzle any child! It touts high power on its box: 200 power, 400 power, 600 power, 1,000 power! It has a mount with thin spindly legs. 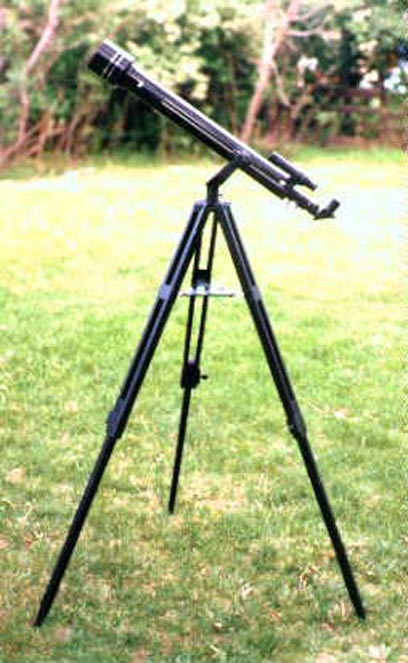 The telescope is attached between the two prongs of a flimsy alt-az mount (the telescope moves up and down, side to side). There is a conspicuous absence of slow motion controls. The high power of the instrument comes from a 4mm or 6mm eyepiece of cheap design and one or more Barlow attachments for 2x or 3x more magnification. This magnification is TOTALLY USELESS. You cannot see anything at this power with this telescope. Do Not Buy One of These Telescopes New! If you already have one and it’s too late to return it, read on. You can make improvements to your telescope that will make it more useful. Should You Buy a Used One Like This? Garage sales are wonderful places. People sell junk for high prices and give away unrecognized gold! Sometimes you run across a good buy. But more often, with telescopes, you will see the typical “Department Store Telescope” like this. What if you run across one of these telescopes at a garage sale? Should you buy it? Do these telescopes have any favorable qualities? Yes, they do. Usually the objective(main lens) is reasonably good. The tube and focuser are useful and the star diagonal (used for right-angle viewing) is OK. The deficiencies of these scopes are the mount, the eyepieces and the finder scope. In other words, there may be hope. Sometimes you can fix one of these small telescopes so that it delivers good views for its size and price. If you are considering a purchase of one of these “Department Store Telescopes” you should check the optics first. Look “down the throat” of the telescope (through the front where the main lens is found). If you see a ring immediately behind the main lens that blocks all but a small circle of light then you should not, under any circumstances buy the telescope. Be careful, reflections can sometimes look a lot like these rings. Be sure you see an actual aperture-stop right behind the lens, that blocks light from the sky. If there is a ring like this farther down the tube ignore it, it’s no problem. Also, the main lens should be at least two inches across. Most are about 2.5 or so. If it’s smaller than 2 inches, you should probably forget it. I’ve seen telescopes like this selling for as much as fifty dollars. Avoid these telescopes. They are not redeemable. Sometimes telescopes that you see at flea markets have been tampered with. Often they have been taken apart. Sometimes they are quite useless even though originally they were functional. Always check the optics of a telescope before you invest any time or additional money in trying to fix one up. If you make the purchase, take the time to jury rig a device that will allow you to support the telescope temporarily while you aim it at a distant street light, mountain or building. Do not look through a closed window or screen. Remove all accessories from the focuser. Insert the lowest power eyepiece (the one with the biggest number on it – often 12.5) See if you can get some sort of a decent image with the telescope. Be patient. It may take you some time to find a target and focus on it. Don’t worry if the image is upside-down. But it should be reasonably sharp and clear. If you see a “Department Store Telescope” at a garage sale or flea market you may be tempted to pay the full asking price – usually about $30.00 to $50.00. Don’t do it! Look at it closely. Does it have that aperture blocking ring behind the main lens? Is the focuser broken? Are there finger prints all over the main lens? Is it missing a star diagonal? If the answers to any of these questions is yes, you should probably walk away. Alternatively you could offer a low price like $5.00. The seller may be desperate enough to accept your offer. If you do “buy it cheap” and it turns out to be useless, then at least you haven’t spent a lot of money. On the other hand, if the optics appear to be intact and clean, if it has a star diagonal and if it has a working focuser then you have the raw material for a usable telescope. By some miracle if it has a decent eyepiece with a large number printed on it like 25mm or 20mm, then you may have a nice little find. Even then, don’t pay more than $25.00! There are superior telescopes made by UNITRON, ZEISS or TAKAHASHI that look similar to the “department store telescope”. Buy anything with these brands with confidence. And there are “Department Store” telescopes made by “big name” manufacturers. Avoid them! If the telescope has some sort of slow motion controls then it may be a good quality scope. If it’s on a fancy and confusing mount with all sorts of knobs and counterweights, it’s probably a good telescope! Buy it and figure out the mount later. (It’s not as difficult as you think.) If it is older it is more likely to be better quality. If it uses 1.25″ diameter eyepieces, it is worth a little more and may be a good scope (Most of these cheap telescopes us eyepieces with a diameter of .965 inch, a little less than 1 inch). If the seller claims he has owned it since 1954, it may well be worth more money. However, if it closely matches the illustration above, it is certainly worth no more than $25.00 and probably a lot less! 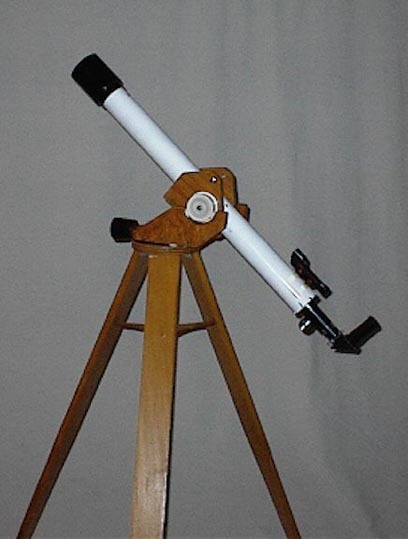 There are instructions on how to build a more sturdy and effective mount for your telescope. If you can correct the shaky mount (a very important factor in the ease of use and comfort of your telescope!) you will get more steady viewing. Here’s another option: Get hold of an eyepiece from an inexpensive or broken pair of binoculars. Usually, even the cheapest binoculars sold to adults contain two useful eyepieces. You can buy a pair of binoculars at a yard sale for $5. Don’t spend much more! ( look for the kind with a “Z” shape to each barrel – these are prism style binoculars. Do not buy one in this price range that is composed of two straight tubes – these are Galillean or “Opera Glasses” and won’t work). Remove one of the eyepieces. The other, undisturbed half of the binocular can often be trimmed of excess material and used as a monocular telescope (very useful if you don’t have a pair of binoculars) or finder for your improved department store telescope. Under no circumstances should you butcher an expensive pair of binoculars for this purpose! A binocular eyepiece will have a fairly long focal length (usually 25mm or so) which will give you low power in your telescope (again, low power is a very desirable trait, believe it or not!). Of course, you’ll be lucky to find one that slips into your star diagonal. If it doesn’t fit you’ll have to use some tape and/or plumbing fixtures and/or ingenuity to fit your eyepiece to the star diagonal. Find a simple way to fit the eyepiece using some tape or whatever. They cost about $15 at sporting goods retailers. Use some inexpensive hardware to attach it to the tube. These finders are much better than the cheap finders on typical “department-store” telescopes. Simply adding some judiciously placed bolts to the tube will make a more effective pointing aid than the “finder telescope” supplied with the scope, which is frustrating and mostly useless. You don’t have to go whole-hog on a complete cheapo rebuild. 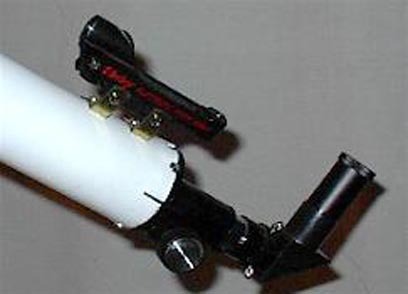 A few simple modifications like on this one will make your telescope friendlier. 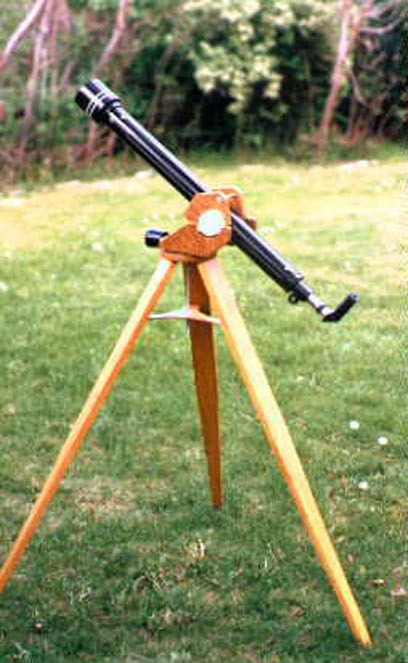 Buy the book Making and Enjoying Telescopes by Miller and Wilson or Build Your Own Telescope by Richard Berry to learn how to build a nice little 4 inch scope like this one. This telescope is far superior to the “department store telescope”. 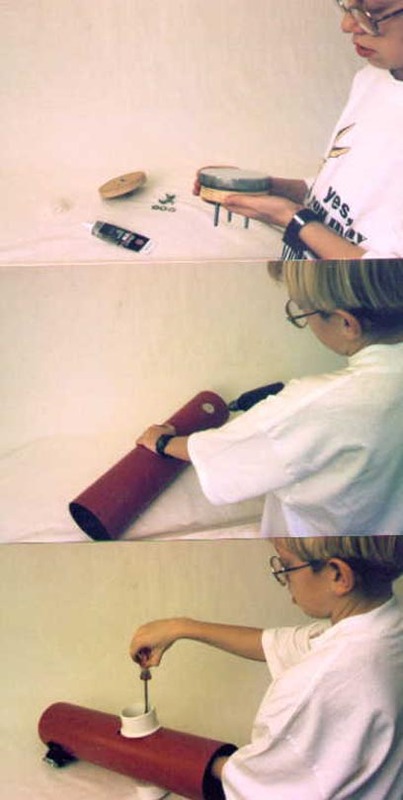 Even a kid can build such a scope with a little help. Here are some pictures of my son, Richard. He built this small scope for about $100 a few years ago when he was about twelve years old. He did have a little help from dad. 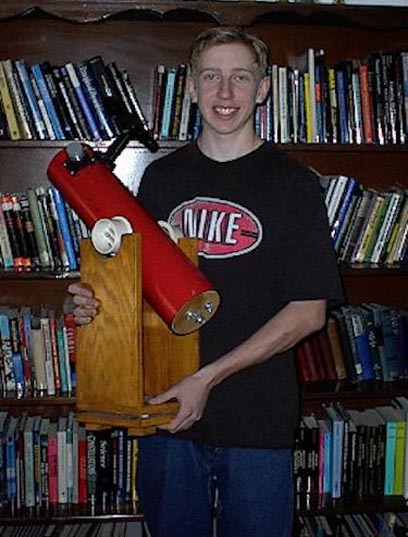 If you are really ambitious you might be able to make a fairly large Telescope. I taught a class on how to make telescopes for several years at the Denver Museum of Natural History. See more details at The Perfect Telescope. Be sure to visit Steve Tonkin’s excellent page on this topic as well. You might like his ideas more than mine!